Conditions: Beautiful. 36 degrees, slight overcast but still great views of Hood. No wind. Great winter day. This last Monday my coworker asked if I wanted to go snowshoeing on Friday. I said absolutely. Later I'd find out that she really just wanted to get her snowshoes back that I borrowed. Whatever gets me outside I guess. So, I called up a friend of mine and asked if she wanted to join. Game, set, plan! We left Portland around 9:15 this morning without any concrete plan of where we were going to go, just drove towards Hood and thought about it on the way. We made a quick stop in Sandy to visit our fellow coworkers at our new Sandy location. Place looks great. Even got to answer a phone call while I was there. "Next Adventure Paddle Sports Center, I mean, Sandy here. This is Brian, what's up? So, we drove on, deciding we'd check out the Mirror Lake trail but upon passing we agreed that we should drive a little further up the mountain. Bennet Pass it was. We rolled into the parking lot which is located at the bottom of the main access road to Mt. Hood Meadows. The drive is about an hour and a half from Portland. It felt great up there on the mountain. Cold, fresh winter air with no bite. Perfect. The parking lot had about 10 cars in it, but not a soul in sight. 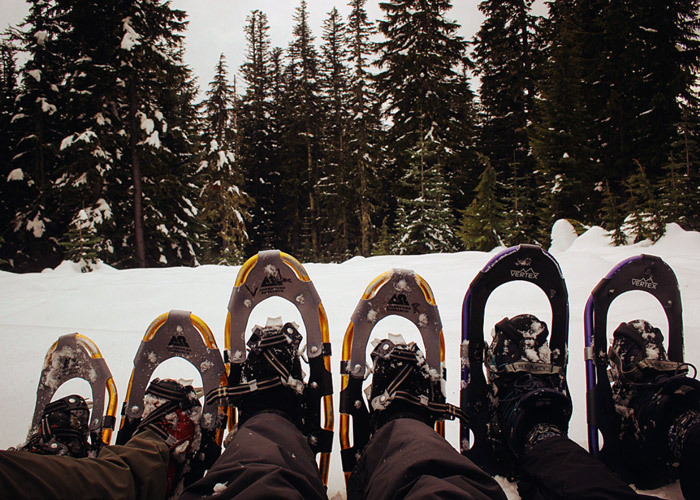 So, let's go snowshoeing, strap up! The trailhead is super easily located right at the end of the parking lot. 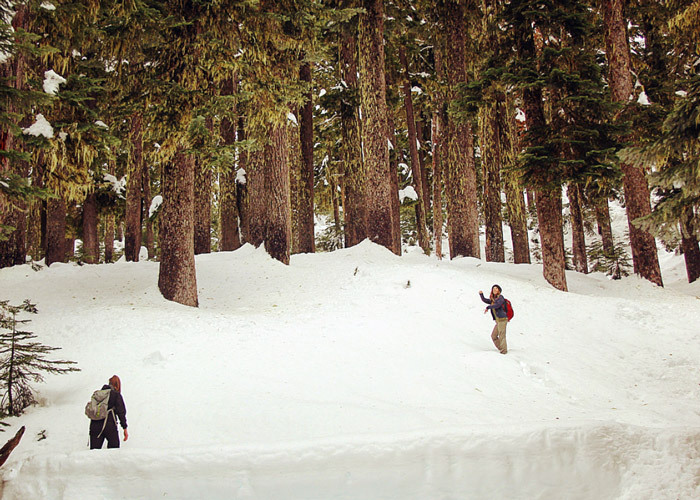 Snowshoeing through those tall snow-covered pines is so great. It would have been absolutely silent in there if it wasn't for our persistent crunch on the snow. The trail was pretty packed down and with the temperature rising above freezing during the day and below at night there was an icy crunch to the snow. We were having a great time trotting around the place. After a mile or two in, we decided to get into some deeper snow and headed up a gradual incline to our right. This was more like it. The trail up until then was fun, but the snowshoes weren't really necessary, we wanted to make them necessary. So, we tromped up this incline having a great time catching our footing on the hill ahead. It was serene in there. So quiet with little black squirrels jetting around us. We decided to hike until we reached what we thought might be the top of the hill. It didn't look that far ahead, although it was hard to tell because of the plethora of trees. Sure enough, though, we were up the hill in about 45 minutes. At the top was a great circle clearing where we sat down to take a break, eat a Clif Bar and drink up on some water. After hiking around the top for a little while we all agreed that our best plan was to retrace our tracks rather than get turned around up there. So that's what we did. 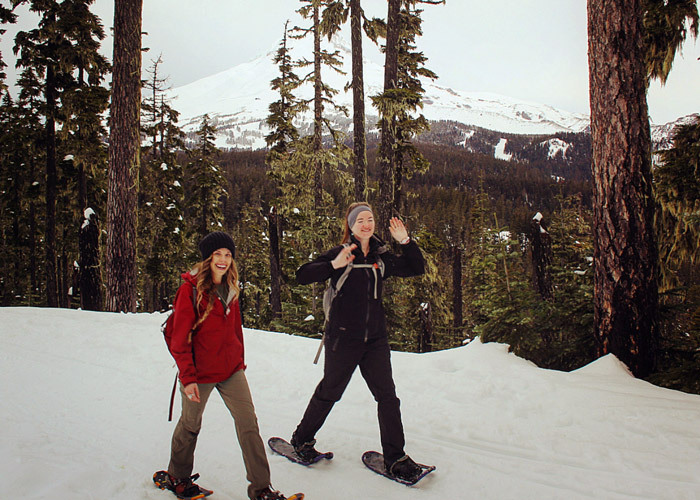 We had a blast snowshoeing back downhill. Occasionally we would hear the slip and thud of one of us sliding and falling in the snow. Soon we were back on the main trail and hiked back out to our car. What a day. 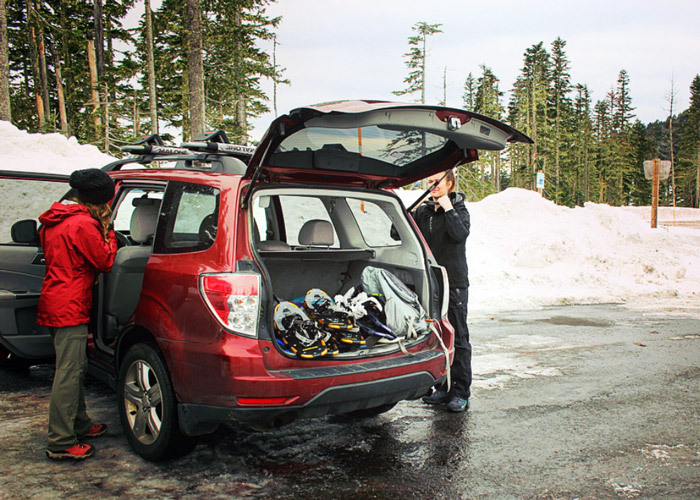 Next time we'll make sure to bring our skis and snowboards and hit up Meadows for a couple laps before heading back to Portland. Instead, we had some late lunch and a beer at Mount Hood Brewery in Government Camp. 10/10 day trip.